Thread: Decision, decisions.... modern quilt background? I'm making a chemo quilt for a friend, and the heart was easy... but now I can't finish piecing until I decide on the background. Several quilters suggested a variety of whites to rest the eye. Another quilt shop owner suggested black, or black and white stripes. Here's the mostly-pieced heart and the pattern. 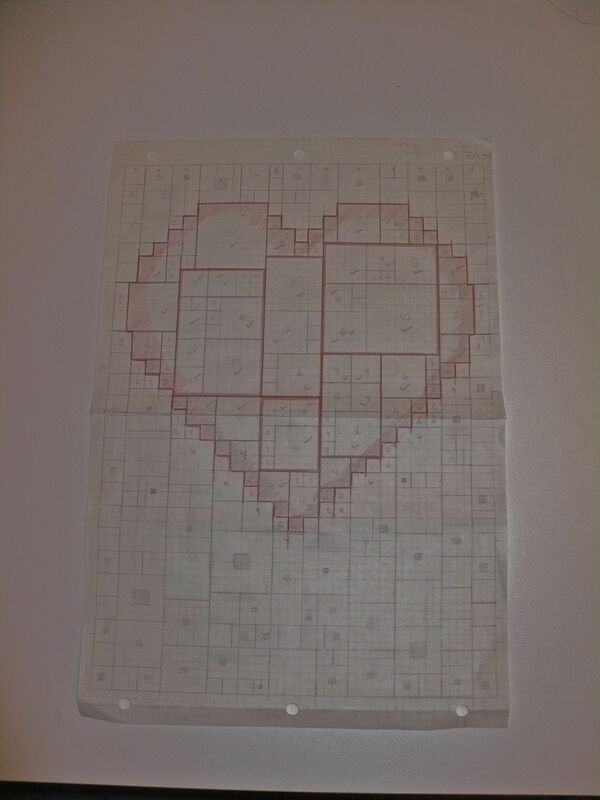 I have it drawn in squares, with centers in some. Do I make the squares white, with colored centers or black centers? Or make the squares black with colored centers? OR black AND white squares with colored centers? Oh, HELP!!!! I like the idea of blacks, too. It makes the heart pop more than I think white would. For the squares with centers, try black with red prints maybe. Or black with any color print that shows up in the heart. Black squares to outline the heart then black and white and grey or black on black or black on grey and white. But outlining the heart black then so forth. On any other quilt I would love the way the black pops the red heart. I am just not sure about a black background for a chemo quilt. I am thinking a yellow? I agree. Yellow would be great, or pink, or use light tones of all the colors in the quilt, but not black. I too do not think black is right. A light pink or pinks would be fine. I have to agree with the others. Although black would make the colors pop it's a bit too somber for this type of quilt. Oh, I can see your point... maybe it would help if I mentioned she's Stage 1 and expected to make a complete recovery. I guess I was trying to design a quilt she'll have and enjoy for many years. I really like your quilt - your friend is sure to love it! well then, the black should be fine. great looking so far!! I really love the look of the black, I don't feel it makes your gorgeous blocks look somber at all. I would choose to do the black all in one fabric though, maybe a batik? So many blacks have green tones or brown tones, isn't it great we all have our different reasons for our choices. Lovely project so far! I know alot of modern quilters are using the white these days, but with all those gorgeous bright colours you might have one errant one bleed, so would chose the black. white background, will be crisp & clean. I'm with the others, that I would be hesitant on the black. Yes, you are expecting a full recovery ... though that does not mean her emotions will always be there. That being said ... I really like the punch that the black would give. How about using a bright navy? or a rich, royal purple? ... both dark enough to give a contrast yet bright enough to not look black. I think both of these could be very effective and give you a really classy rich look to the finished quilt. Your design is really great ... quite clever! I'm not sure of the definition of "modern quilt". What I've seen doesn't use black, I think. It's more clean, crisp. So my thinking is white or very pale grey with, the centers being the lighter colors in the heart. I like what you've got and I think either black, as you've shown, or a white would contrast nicely. But then I'm just delving into the "modern" quilt type of thing and suppose I shouldn't give too many opinions. Anyway, I love your quilt. I guess I'm not traditional enough and just think of black as 'classy' and not necessarily as "somber". No help from here on color decision, just think that will be a great quilt. Love what you've got going here! I would think any subtle-ly patterned tonal for the background would be faboulous - you know black with the dark gray swirly, filigree type designs, blue, white, off white, any color - the background is you color palette - pick a color the recipient favors! Would LOVE to see this when you finish! Isn't white the "preferred" color for modern quilts? I agree that the black is not right. But yellow against the red? ; not for me. Having had breast cancer 2 years ago (and doing great now) I like the idea idea of blacks around the heart and then graduating to lighter colors. Anyway you decide - I'm sure she will love it. I really like the heart!! If you haven't decided yet what to do for a BG on this. If I were making it I would continue the square blocks in mostly deep shades of purple to have a contrast around the heart and keep building the blocks with the deep purples w/ a little of all the other materials in the heart. I love your design and whatever you do it will be very cool. I personally would not use black, I think a medium sky blue, mottled or tonal would show off the heart but connect color to the outside edge. Thank you for showing the pattern and picture. I just love the different sizes and blocks. 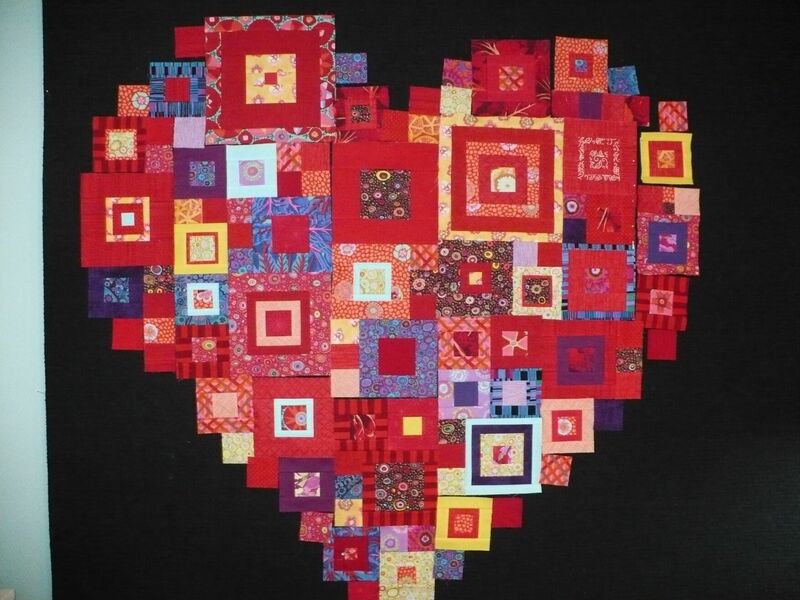 I just happen to have a lovely heart quilt with an off-white background and red borders. Didn't make it, but it is a favorite. Love your quilt. Love that you're making this "gift of love" for her!! I see a lot of purple/dark blue in the squares. You might consider using those colors in the background. Do know I wouldn't use all black... no matter who I was making it for.